As a mum of four kids, now aged 15 to 23, the laundry is one of the busiest rooms in our house. Children grow, and so does the washing, sorting, folding, and ironing. From nappies (I used cloth), play gear, and bibs for babies, to school uniforms, swimming, hockey and footy gear for school-aged kids, to silk dresses, gym gear and work clothes for young adults… it never stops. Not to mention five sets of sheets and six bath towels every week. So, let me tell you from experience that a home with a big family can be chaos if laundry routines are not established early to help make the house run smoothly from morning to night. 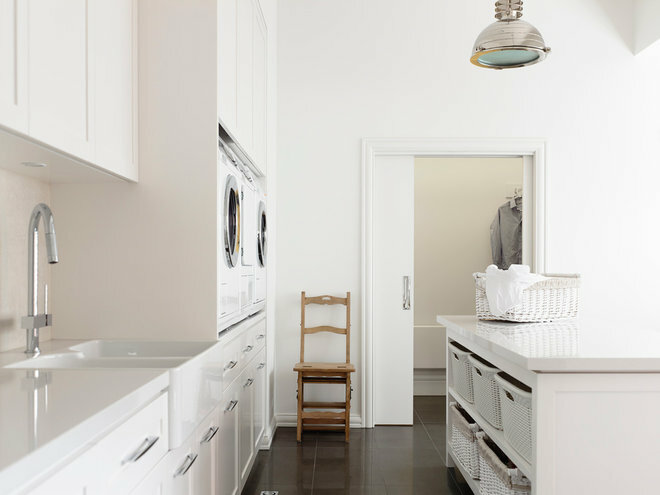 As an interior designer and self-confessed organiser, I love a beautiful laundry and believe a well-designed and organised laundry room can make your life better and your family happier. Here are my hard-won tips for making your laundry a spacious, organised, functional and happy place. A big family requires a big laundry. Too often the laundry is the smallest room in the house, but with three or more children you need lots of room for sorting, washing, drying, folding and ironing. 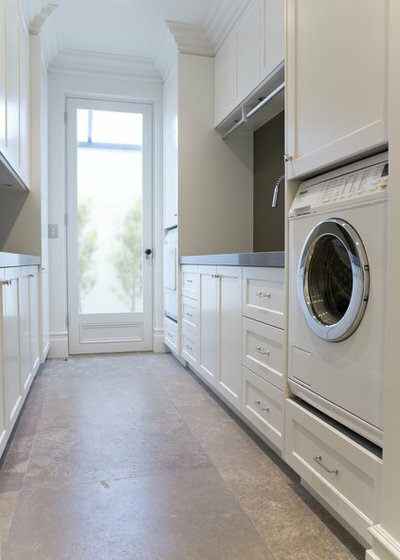 If you are renovating or building, allow plenty of space for your laundry. 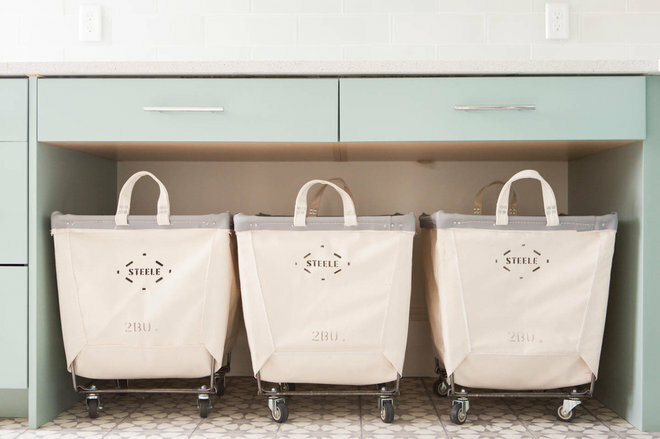 This laundry in a renovated traditional-style home in Sydney ticks all the boxes. 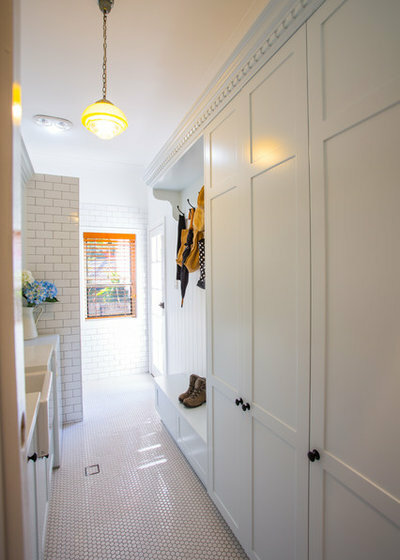 Make sure there is enough built-in storage space behind closed doors for the things you don’t want to see, such as the vacuum cleaner, mop, brooms and buckets. As well as closed storage, incorporate open shelves for rattan baskets and crisp white folded bath towels. This renovated home in Prahan in Melbourne has a combination of functional storage and open shelving, making the room feel warm and welcoming. This award-winning laundry in Melbourne’s Doncaster features a traditional butler’s sink and tapware to create that farmhouse feeling in the city. A large sink that is easy to access and use is essential for washing dirty soccer boots, filling buckets and rinsing and soaking clothing. Why not have a sink that looks good too? For a big family, having two washing machines and two dryers means you can get through double the amount of washing, and wash sheets and towels as well as clothes in one day. 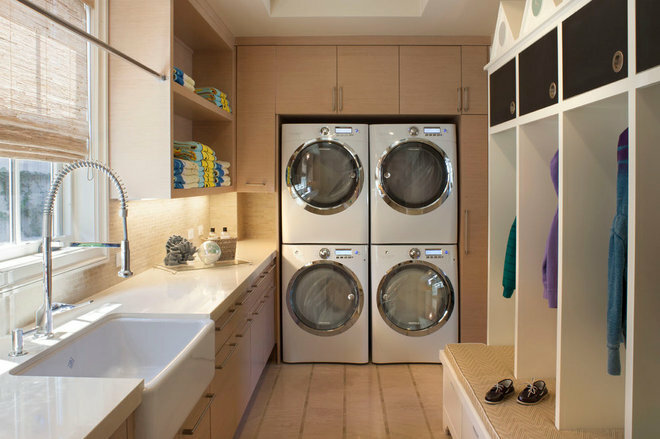 If you have the space, design cabinetry to house two sets of stacked dryers and washing machines, as in this laundry in a family home in Los Angeles, California. Or if you prefer, install two washing machines and indoor and outdoor clotheslines as an environmentally friendly option. Washing baskets often get in the way and end up on the floor or on top of valuable bench space. Open shelving allows washing baskets to be easily accessed and put away. Choose traditional wicker baskets with a cotton lining, or matching modern hard plastic baskets to suit the style of your laundry. This laundry in a Californian bungalow in Melbourne provides plenty of open storage and work space. Instead of putting all your family’s dirty washing into one overflowing basket, divide your laundry into three baskets for darks, whites, and colours. Your washing will then be already sorted and ready to throw into the machine. You can also teach children to divide the washing into the baskets instead of just dumping their wet towel on the floor. These laundry hampers in a home in Salt Lake City, Utah make it easy to wheel the washing to the washing machine. 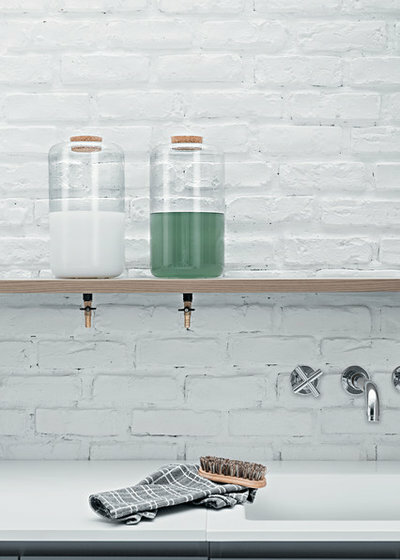 Empty your detergent into attractive glass bottles for ease of use and for aesthetics. You will enjoy spending time in your laundry if the room is designed with thought and attention to detail. To sort clean clothes, allocate a basket to each member of the family. Simply divide the clean clothes from the clean washing basket into the labelled baskets. When the baskets are full, place them at the end of the children’s beds. As soon as children are old enough, they can help to put away their own clothes. 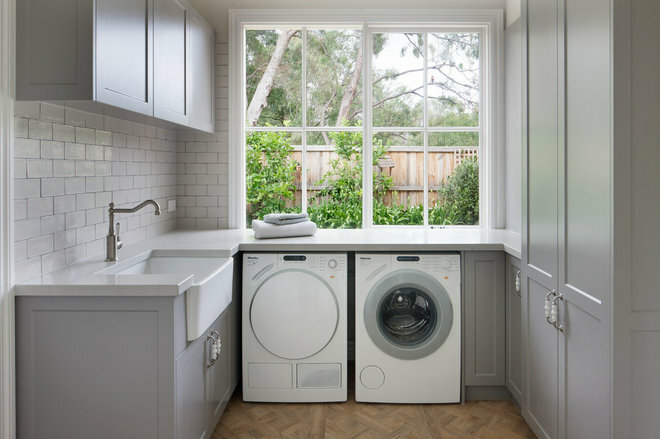 This laundry in a renovated family home in Kew, Victoria is bright and friendly and has lots of space for under-bench baskets, making it easy to distribute laundry. A fun idea is to use basket liners with your children’s names embroidered on them. Rather than a built-in ironing cabinet, a stand-alone ironing board is a more flexible option so you can iron in front of the TV or looking out at the view. Create a spot in your laundry so your ironing board is easy to use and put away. Purchase a custom-made ironing board cover in a quality cotton to fit in with the style of your laundry rather than a Teflon cover. A hanging rail is essential for hanging ironing in the one place, and can also be used for drying clothes on hangers. This traditional-style laundry for a young family in Birmingham is small but functional and organised. If you haven’t got room for a built-in rail, purchase a clothes rail on wheels. 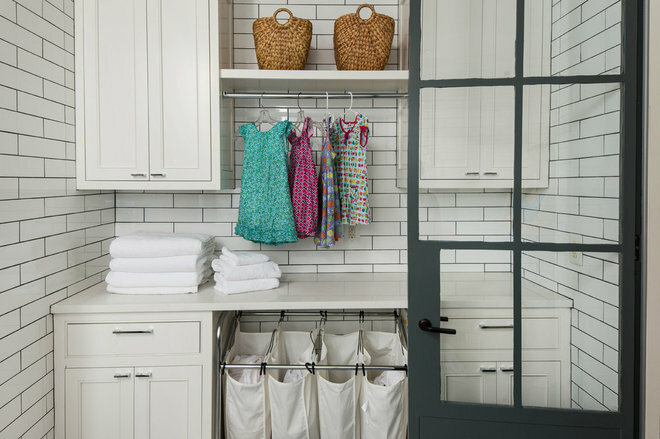 Place a mudroom in the laundry to create a central drop-off point for the kids’ school bags, hats, shoes and sports gear. Wash the footy boots and put them back on the shoe rack ready for the next morning, so your little footy player is not looking all over the house for his stuff before school. 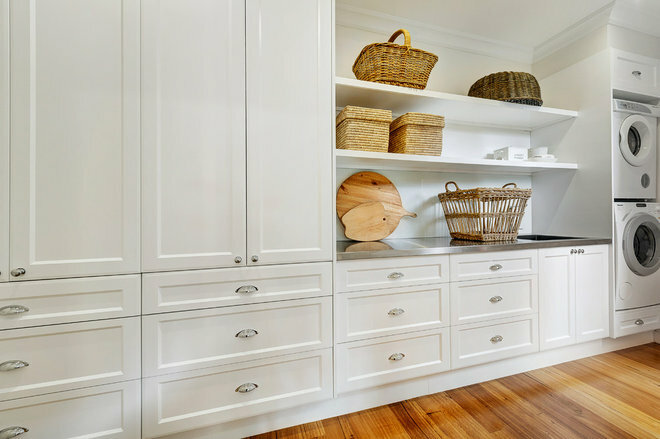 This Hamptons-style laundry in a renovated Queenslander in Brisbane features an entry into the home via the mudroom and laundry; perfect for kids coming home after school to dump their shoes and bags before entering the house. 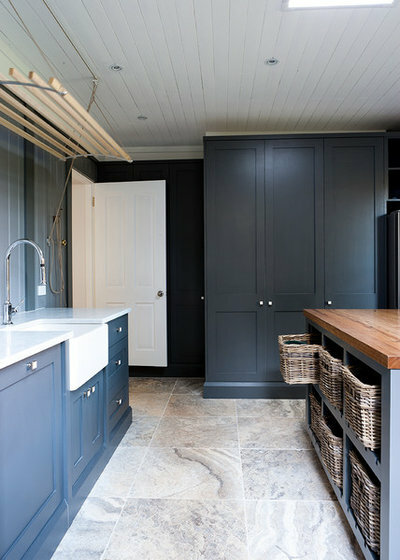 Dedicate a large cupboard in your laundry for linen. 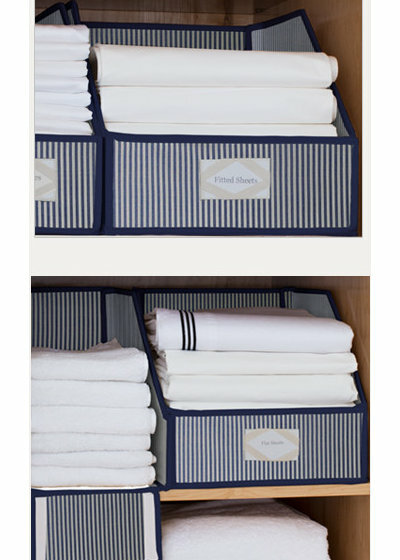 When your linen is clean and folded, you can put it away immediately. To save space, only keep the linen you need; two sets of sheets for each bedroom, and a set of two towels for each bathroom. Fold the linen neatly, iron pillow cases and keep sets of linen together in baskets or storage boxes labelled clearly. If you can afford it, buy good-quality linen that washes beautifully and lasts for a long time. Install a panel of glass in your laundry door, or expansive glass windows, to allow natural light into your laundry for a healthier environment. As well as saving on electricity bills and saving energy, natural light improves your mood and productivity. The glass door in this heritage home in Sydney’s Double Bay floods the room with light and allows easy access to a courtyard and a clothesline. Save on electricity bills and think of the environment by installing a clothesline outside your laundry. Sunlight helps to kill dustmites and keeps your clothes and sheets smelling fresh. Enjoy being outdoors and breathing in the fresh air. 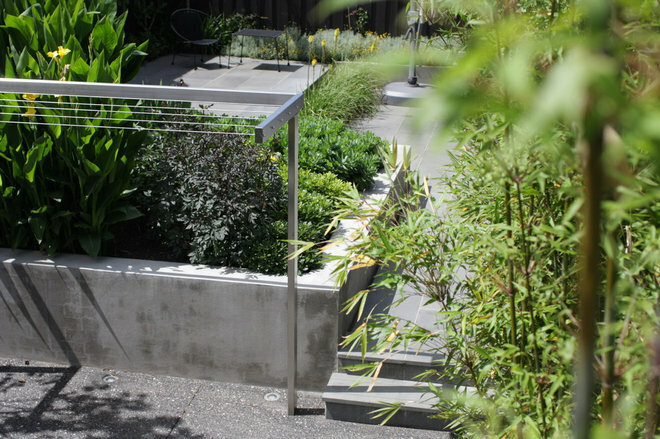 This clothesline in the courtyard of a contemporary home in Melbourne, designed by landscape architects Verdigris, blends in with the materials used in the courtyard and connects with the environment. A traditional laundry airer, which runs on a pulley system, is a valuable addition to a laundry room. 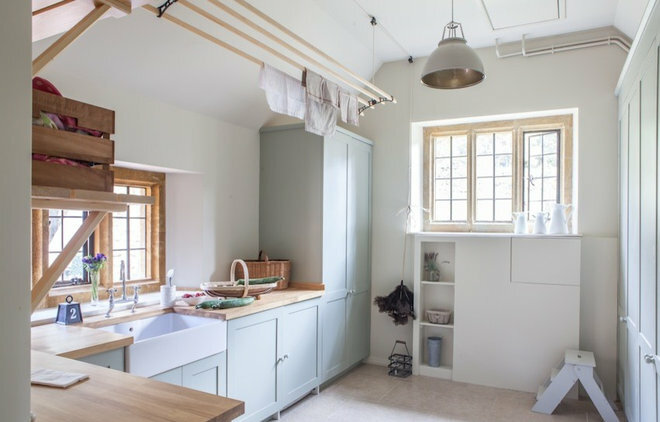 This is an example of a country laundry room in Oxfordshire, UK. Sometimes the old ideas are the best. Traditional ceiling racks look beautiful, and the pulley that moves them up and down is a simple and effective system. 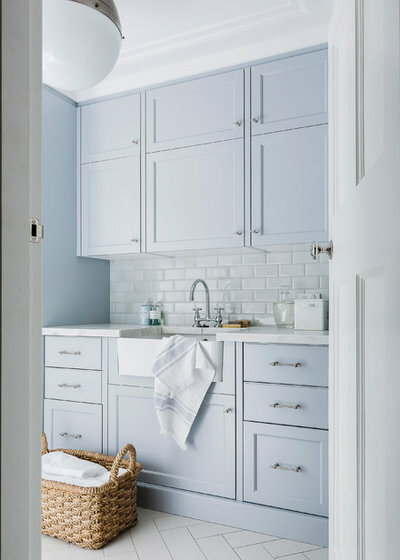 This pretty blue laundry in a restored 1930s home in Wahroonga, Sydney, is a calming space with cabinetry designed to fit in with the style and era of the home. 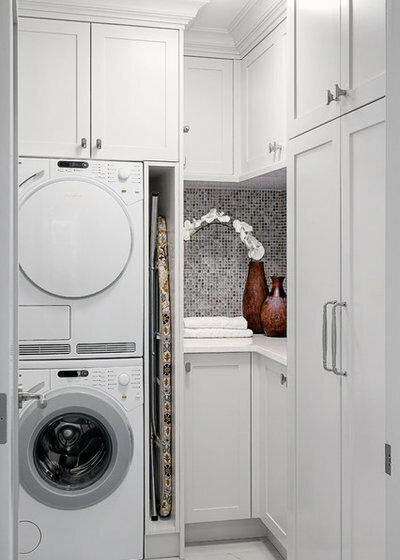 Your laundry should be given equal importance to your kitchen and bathrooms, and not seen as an afterthought. 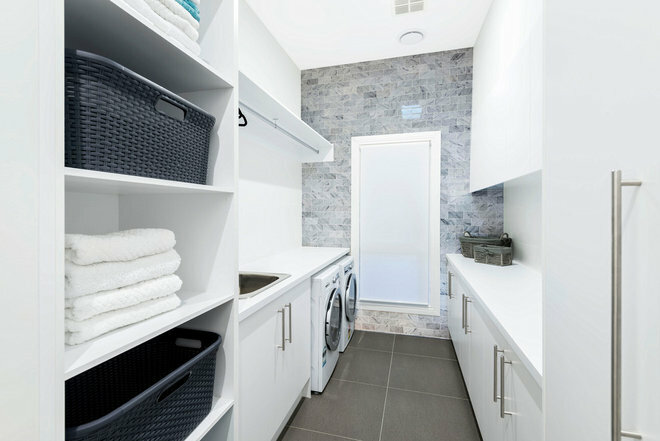 Use a designer to help you maximise space and create a functional and beautiful laundry that you will enjoy spending time in. 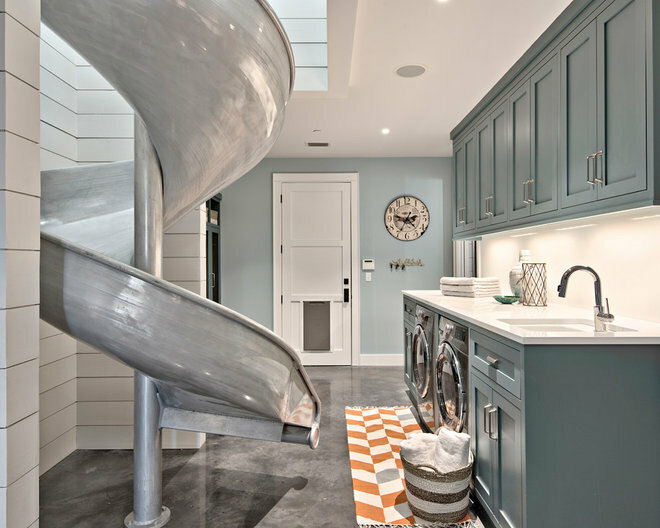 You could even make your laundry kid-friendly like this one in Austin, Texas. Houzz Australia Contributor. With a family of four children and having lived in Brisbane, Melbourne, Singapore and Shanghai, I am able to draw on both my professional and personal experience to create a home that will not only be beautiful and functional for your family but also reflect who you are and what home means to you.